Kinetico Kube – Elgin Pure Water Inc. If you’re tired of waiting for the pitcher to fill, and you’ve ruled out a reverse osmosis system as an option, take a look at Kube. It installs conveniently and easily under just about any sink, so your filtered water will be dispensed from your existing faucet. Kube will improve the quality, taste and smell of your drinking water and give you the peace of mind that you’ve done more to improve the quality of your water. 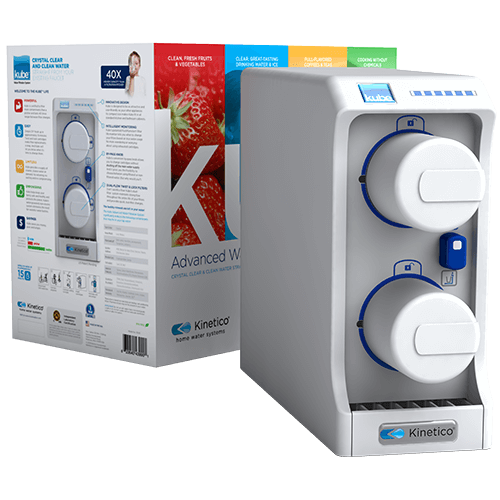 Kube is a great way to experience better drinking water and a wonderful introduction to Kinetico’s extensive line of water treatment products. And you’ll be impressed by the plentiful supply of filtered water that Kube provides for all your drinking and cooking needs. In less than 15 minutes you can have clean, crisp refreshing water. Kube is certified to remove more contaminants than filter pitchers and faucet-mount systems. Kube fits perfectly under most sinks, so filtered water can flow from your existing faucet. At only around 1 cent per litre, Kube water is great for all your drinking and cooking needs. Shows the remaining filter capacity and alerts you when a filter change is needed. The twist and lock design for Kube filters makes filter changes quick and easy.